Portrush Town Hall is the 2018 Summer Theatre venue for popular amateur drama group, The Country Players. From Wednesday, July 25th to Saturday, July 28th past and present members of Glarryford YFC will perform Pull the Other One, a farce by Norman Robbins, with kind permission of Samuel French Ltd, London. 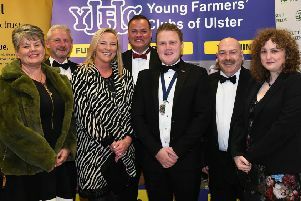 Thanks also go to Glarryford YFC for use of rehearsal venue, the Gregg Hall and to G Kennedy and Sons, 133 Tullaghans Road, Dunloy, Ballymena for scenery transport. This summer’s Country Players’ chosen charity is Charis House, the mid-Ulster centre offering support and therapies to cancer sufferers and their families. Charis House receives no government funding and relies on donations to continue its excellent work. Summer Theatre curtain-up is at 8pm each evening. To be sure of a seat book through the box office on 02870829539. Mark McAuley, leader of Glarryford YFCU Club of the Year 2017-18, uses his dramatic talents in Pull the Other One to play the part of Ballymena man, Albert Perkins. His loving wife, Muriel is played by Ashleigh Harbinson. Albert’s overbearing mother-in-law, Mrs Boadicea Heppinstall (Sharon McConnell) is a frequent, if not always welcome, visitor. Boadicea “accidentally” steams open a letter meant for her keen bell-ringer son-in-law, Albert. She puts two and two together and gets five! Her dutiful daughter, Muriel is told by Boadicea that the letter is from Albert’s fancy woman, Hilary Armitage (Adam McAuley). Mrs Heppinstall vows to protect heart-broken Muriel from wayward husband Albert and “the other woman” but does not reckon on the intervention of Albert’s kindly neighbour, Wilf Perkins (Sammy Park) and Albert’s accidental meeting with ambitious local artist, Virginia Brown (Siobhan Lemon). Reverend Elijah Nookey (Mervyn Dickey) also has news to share that will upset Boadicea’s plans. Behind the scenes team include Des and Margaret Ferguson, Michel Hemmery, Dermot Lemon, Andrew McAuley, Cameron and Ross McConnell, Beth McCormick, Abbie Millar and Ken Rock. This is an action-packed comedy and the Country Players can guarantee audiences a night to remember.